So, anyone who knows me well enough will know that im a superman nut job. Literally, i named my son after him (Clark, not superman, that would just be silly, also his mother will vehemently deny this but its true). I have paintings (thanks to my bro), clothes, toys, whatever etc, but the one thing that every die hard superman fan should have is of course a costume. Now when i say costume, i don't mean a cheap rubies one you can pick up for twenty quid, no no, i mean their own proper superman suit. This isn't something i made. 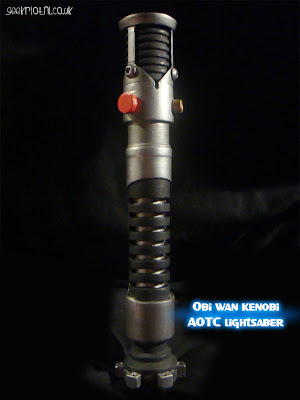 In fact it was a raw cast from a mold used on Star Wars: Attack of the Clones. I bought it a few years ago and never touched it, mainly because i had originally planned to have it chrome dipped. Turns out whatever resin it was cast in wouldn't have stood up to the process, so i hand painted it instead. I spent a week spot filling it with u-pol polyester paste to get rid of any small holes or imperfections, gave it a wet sand, primed and painted. The end result wasn't too bad...but i still wish it could have been chromed! The helmet is about half way to being finished now. Really all i need to do now is refine the edges (alot) the badge needs a bit more width and then the badge made and fitted. I'm also considering adding a bit more height to the raised red edges to make them more defined! 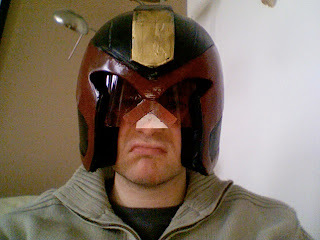 So ive finally decided to throw up some pictures of my Judge Dredd Helmet! Originally i had wanted to make a more comic style version (and started a Pepakura version which ill post about another time) but after seeing Dredd3D and loving that helmet, i decided to give it ago. This was a project i had wanted to try for a little while. Before i get to it theres a bit of back story i need to explain. Im a massive Judge Dredd fan, have been for many years, read the comics, books and seen the flicks (both of them). I have always wanted a Judge Dredd helmet/costume/lawgiver, so naturally i thought seeing as halloween was round the corner i would get stuck in. So! First up i decided to work on was the Lawgiver. For those not familiar with what that is, its the pistol used by the street Judges of Megacity One. Copyright Steve Robb 2012. Awesome Inc. theme. Powered by Blogger.